President's Day is the day we celebrate two of America's most beloved Presidents, Washington and Lincoln, so I want to share a few Art History findings about pieces they inspired! Washington was the obvious and popular choice for America's first President, having served valiantly as the First Commander-in-Chief of the Continental Army. He was an admirably brave, yet humble and faithful man, and highly regarded by his contemporaries. At his death, Washington was hailed as "first in war, first in peace, and first in the hearts of his countrymen." This portrait of George Washington, is from the Smithsonian's Jacob Kainen papers. 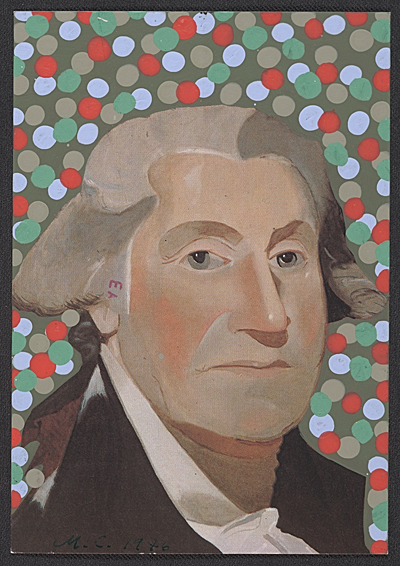 It is a holiday card sent to Jacob Kainen in 1977 by Michael Clark, who embellished a postcard print of his Washington portrait with large painted dots. It was difficult searching for more contemporary homages to Washington and Lincoln. I found this via Archives of American Art, which is a phenomenal resource. This is the Official White House portrait of Lincoln, painted in 1869 by George Healy. The artist has portrayed "Honest Abe" in a pose of intent listening. 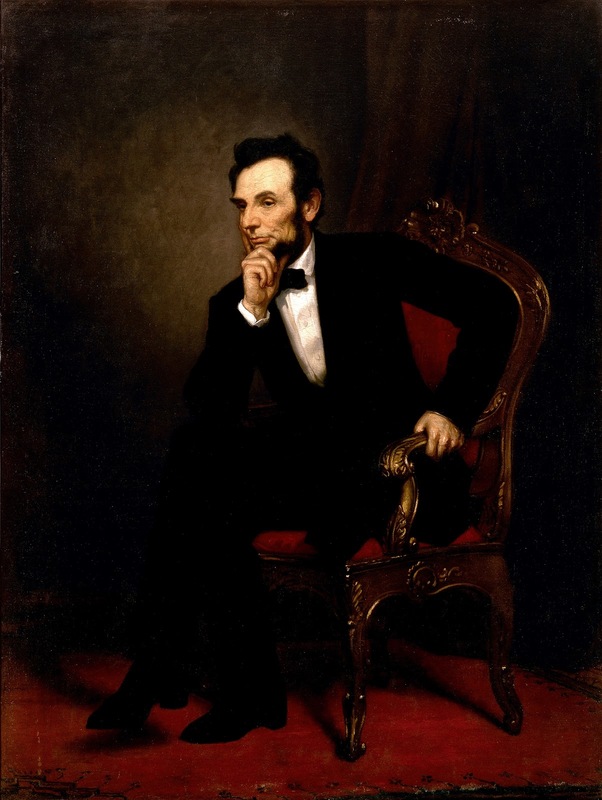 The portrait was painted in Paris and sent to Washington in response to an act of Congress (March 3, 1869) authorizing a Lincoln portrait for the White House. It hangs in the State Dining Room of the White House. 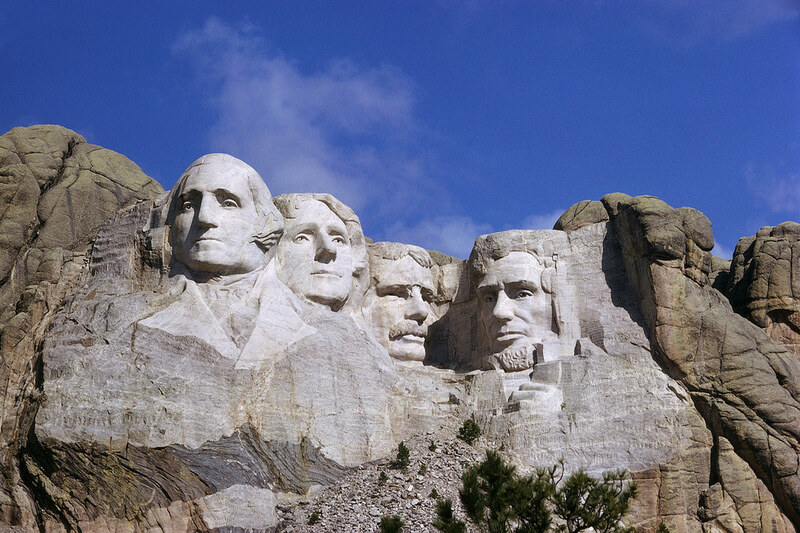 Between October of 1927-1942 Gutzon Borglum and 400 workers sculpted the enormous 60 foot likenesses of four of America's most esteemed Presidents, Washington, Jefferson, Roosevelt and Lincoln, into the Black Hills region of South Dakota. The site for the monument was "Mount Rushmore," the tallest mountain in the region, composed of durable, fine-grained granite, which only erodes 1 inch every 10,000 years. It was originally planned for each President to be rendered from head to waist, but lack of funding forced construction to end in October 1941- sometimes the best designs really do happen by accident! I think the simplicity of the busts retain the natural beauty of the site itself. On October 15, 1966, Mount Rushmore was listed on the National Register of Historic Places, and is South Dakota's top tourist attraction today. Today we celebrate how much our country has accomplished since its inception, and are thankful for the courageous leaders who have served America in times of success and turmoil. To live in a country where our government is freely elected by the people is a freedom we are truly blessed to have!